As asylum seekers and migrants continued to arrive en masse on European shores into early 2016, and the United States and Europe faced terror attacks in Brussels, Orlando, and Nice carried out by radicalized immigrants or members of the second generation, the policy responses on both sides of the Atlantic differed in some key ways. While policymakers in the United States quickly alighted on refugees and the perceived security threat they could present, the European debate elevated long-held tensions over migration and integration, with a particular focus on marginalized and radicalized Muslim youth. Despite little credible evidence of resettled refugees posing a terrorism risk in the United States, many politicians on the right called for additional screening or even a complete suspension of Syrian refugee resettlement—their voices most powerfully channeled during the presidential campaign by Donald Trump. Although Europe suffered more mass-casualty terrorist attacks in 2016 than the United States, European debates centered less on security concerns and more on broader feelings of having lost control over both arrivals at European Union borders and the changing face of local communities. After record inflows of asylum seekers and migrants in 2015, EU leaders finally managed to stem irregular arrivals into Greece by approving a controversial deal with Turkey in March 2016, promising billions of euros, visa liberalization, and other incentives for a halt to the flows. By this time, however, public trust in governing institutions and technocrats had already suffered an enormous blow, amid images of seemingly endless entries via sea and land, and overwhelmed reception and asylum processes. As European policymakers struggled to coordinate an effective response, far-right and populist parties in countries ranging from Austria to Sweden gained ground among increasingly disillusioned and concerned publics (for more on these parties, see Issue #5: As Publics Fear Loss of National Identity, Far-Right Populist Movements Gain Strength). In an attempt to regain legitimacy and public trust, some European leaders have turned to direct democracy. The most high-profile of these referenda was the decision by UK voters to leave the European Union. Despite the United Kingdom having received relatively few irregular arrivals or asylum seekers in recent years, compared to other EU Member States, immigration was foremost among voters’ concerns and was a prominent feature of the Leave campaign. Similarly, when Italians rejected the constitutional reforms backed by Prime Minister Matteo Renzi—triggering his resignation—many commentators interpreted it as a referendum against establishment politics in favor of the anti-immigrant and populist parties that spearheaded the No campaign. As several EU countries—including France, Germany, and the Netherlands—head into national elections in 2017, immigration and integration issues are poised to play a major role in voters’ decisions. With such deeply divided electorates, it will be particularly critical for incumbent leaders to prove their ability to meaningfully engage with the immigration fears and anxieties of their constituents. Immigration policy and public attention in the United States have long centered on immigrants from Latin America—the largest and most visible migrant group in the country. While significant attention has been devoted to the growing numbers of Central American families and children arriving at the U.S.-Mexico border since 2014, focus in late 2015 and 2016 turned to a significant extent on Muslim immigrants and issues surrounding refugee resettlement. Within days of the Paris terrorist attacks in November 2015, and with positions hardening throughout 2016, Republican governors and legislators have sought to halt refugee resettlement, and in particular of Syrians. During the presidential campaign, Trump proposed a ban on Muslims entering the United States, the imposition of ideological screening tests, and a registry for nationals from “high-risk” countries. Americans’ anxiety about Muslim immigrants centers largely on terrorism, yet an extensive analysis by New America researchers found that of the 345 terrorists to espouse jihadist ideology in the United States since September 11, 2001, 77 percent were U.S.-born or naturalized citizens, as of November 2016. In the absence of supporting evidence, the public’s fears can be largely attributed to national narratives that link immigration and threats to national security, in which the actions of a few terrorists have colored public perception of a large and diverse group—and some media and politicians on the right have played up these threats for political advantage. 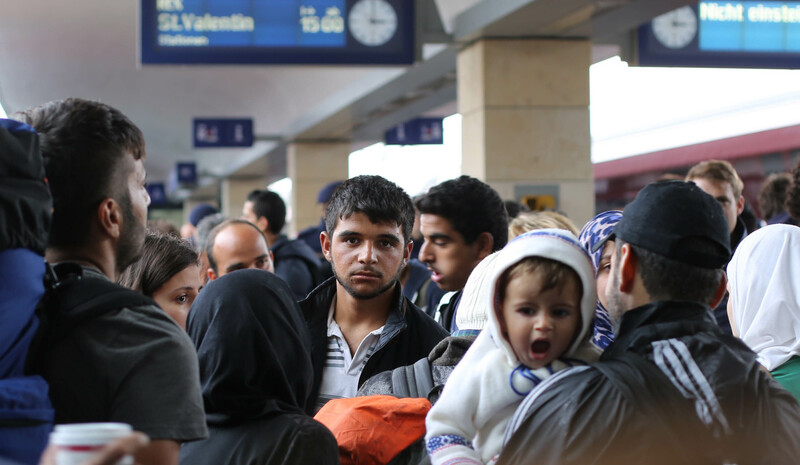 As 2016 draws to a close, future U.S. immigration and refugee policies remain unclear. The Obama administration planned to raise the number of refugees admitted to the United States in fiscal year 2017 to 110,000, a 30 percent increase from the current 85,000. But in both campaign and postelection statements, Trump has promised dramatic change. Top 10 of 2006 - Issue #10 How to Fight Homegrown Terrorism: Surveillance, Outreach, or Both? Bergen, Peter, Albert Ford, Alyssa Sims, and David Sterman. 2016. Terrorism in America After 9/11. Washington, DC: New America. Available online. Chrisafis, Angelique. 2016. French Mayors Refuse to Lift Burkini Ban Despite Court Ruling. The Guardian, August 28, 2016. Available online. Foster, Peter. 2016. Anti-Muslim Sentiment on Rise in Europe Due to Migration and Isil as Continent Rejects Multi-Cultural Society. The Telegraph, July 12, 2016. Available online. Horton, Helena. 2016. Muslim Ban Statement “Removed” from Donald Trump's Website. The Telegraph, November 10, 2016. Available online. Ipsos MORI. 2016. Immigration Is Now the Top Issue for Voters in the EU Referendum. London: Ipsos MORI. Available online. Jordan, Miriam. 2016. President Obama to Increase Refugees Admitted to U.S. by 30%. The Wall Street Journal, September 14, 2016. Available online. Kirchgaessner, Stephanie. 2016. Italian PM Matteo Renzi Resigns After Referendum Defeat. The Guardian, December 5, 2016. Available online. Local, The. 2016. Denmark's Queen: Living Here Doesn't Make You Danish. The Local, October 24, 2016. Available online. ---. 2016. French Mayor Bans the Burqini on Riviera Beach. The Local, August 12, 2016. Available online. Papademetriou, Demetrios G., Richard Alba, Nancy Foner, and Natalia Banulescu-Bogdan. 2016. Managing Religious Difference in North America and Europe in an Era of Mass Migration. Washington, DC: Migration Policy Institute. Available online. Papademetriou, Demetrios G. and Natalia Banulescu-Bogdan. 2016. Understanding and Addressing Public Anxiety About Immigration. Washington, DC: Migration Policy Institute. Available online. Sherman, Amy. 2015. What Is the Citizenship Status of Terrorist Suspects in the United States? PolitiFact, December 29, 2015. Available online. Troianovski, Anton. 2016. Germany’s Merkel Pushes to Ban Full Facial Veil. Wall Street Journal, December 6, 2016. Available online. Weisman, Jonathan. 2016. Change Ahead: Shifts on Immigration, Climate, Health and Taxes. The New York Times, November 9, 2016. Available online. Wike, Richard, Bruce Stokes, and Katie Simmons. 2016. Europeans Fear Wave of Refugees Will Mean More Terrorism, Fewer Jobs. Washington, DC: Pew Research Center. Available online. Ye Hee Lee, Michelle. 2015. Donald Trump’s False Comments Connecting Mexican Immigrants and Crime. The Washington Post, July 8, 2015. Available online. How to Fight Homegrown Terrorism: Surveillance, Outreach, or Both?